Great read, I couldn't put it down! The style is down to earth, good pace, and keeps you dying to turn the page and find out what happened next. The science/medical details are given accurately but easy enough for any layman to understand. I love the way Mr. Brown relates difficult concepts to familiar topics, some great analogies here. He is honest in a warm, humorous, and no-nonsense way about the physical and psychological issues he has faced, and his attitude is inspiring and motivational. 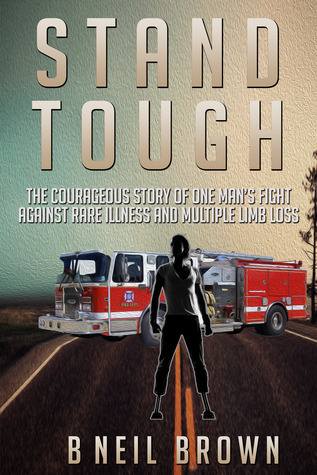 I would recommend this book to anyone - it is not just a book about amputation or illness, but about perseverance and strength in the face of life's adversities, which speaks to all humanity. Highly recommended! This book is an inspiration to anyone who has ever went through a health crisis! This book is very inspirational. I am so glad that I read it. Makes me think I can handle anything that comes my way! Brave story of a courageous young man. B. Neil Brown - B. Neil Brown is a father, a brother, a son, a fire fighter/EMT, an avid motorcyclist, an author,a Gracie Jiujitsu student, and a triple amputee In no particular order.Neil lost his legs mid-November of 2010, and has spent much of his time since the amputations helping other amputees cope with their own loss through peer visits, and proving everyone wrong who told him he "can't" because he lost his legs and fingers.